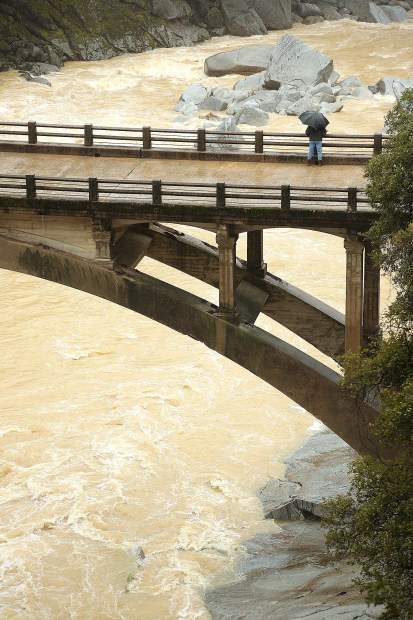 Alta Sierra's Laura Patrick dons her umbrella as she watches the sediment-laden waters of the South Yuba River flow under the old Highway 49 bridge during Wednesday's storm. Grass Valley received 2.5 inches of rain within a 24-hour period Wednesday with a total of up to 10 inches of precipitation forecast through Monday morning. Winter storm Nadia continued to wreak havoc up and down the West Coast — including Nevada County — Wednesday bringing about 2.5 inches of rain in a 24-hour period and gusty winds that blocked roads and caused power outages throughout the region. The National Weather Service has forecast up to 11 inches of precipitation in Grass Valley through Monday morning. A majority of that is expected to come as snowfall — between 18 to 24 inches — to begin falling mid-day today through early Monday morning. Between 2 to 5 feet of snow is expected above 5,000 feet of elevation through Monday morning. Today low snow is expected at about 1,000 feet elevation before rising to 2,500 feet by 4 p.m. and 6,000 feet by evening. High temps today are expected to be in the lower 50’s before dropping to the upper 30’s Friday and Saturday. Low temps will remain in the mid to low 30’s to upper 20’s through much of the following week. A flood and wind advisory is also in effect for the next few days with south winds expected to be in the 20-30 mile per hour range, gusting up to 40-55 miles per hour. The Yuba River will be entering flood monitoring stage as it passes through Marysville. Locally, residents are cautioned to watch area creeks and waterways, especially if living near Wolf Creek through Grass Valley, and Deer and Little Deer creeks through Nevada City.